A team of scientists from China, Norway, and France revise the view that the Sahara desert has existed for only the last 2 to 3 million years. The study was published on September 18th in Nature. The Sahara is the world’s largest subtropical desert. During the last decades, numerous scientific studies have probed its geological and archeological archives seeking to reveal its history. Despite some important breakthroughs, there are still basic questions that lack satisfactory answers. For example, how old is the Sahara desert? It is widely believed that Sahara desert first appeared during the last 2 to 3 million years, but recent discoveries such as ancient sand dunes and dust records in marine cores push the possible onset of Saharan aridity back in time by several million years. Until now, however, there have been no good explanations for such an early Sahara onset. The study, led by ZHANG Zhongshi, under the collaboration between China and Norway, pinpoints the Tortonian stage (~7-11 million years ago) as a pivotal period for triggering North African aridity and creating the Sahara desert. The research team includes Gilles RAMSTEIN from Laboratoire des Sciences du Climat et de l'Environnement; Mathieu SCHUSTER from Institut de Physique du Globe de Strasbourg; Camille LI from the University of Bergen and the Bjerknes Centre for Climate Research; Camille CONTOUX from the Bjerknes Centre for Climate Research, Uni Research Climate; and YAN Qing from the Nansen-Zhu International Research Centre, Institute of Atmospheric Physics, Chinese Academy of Sciences. 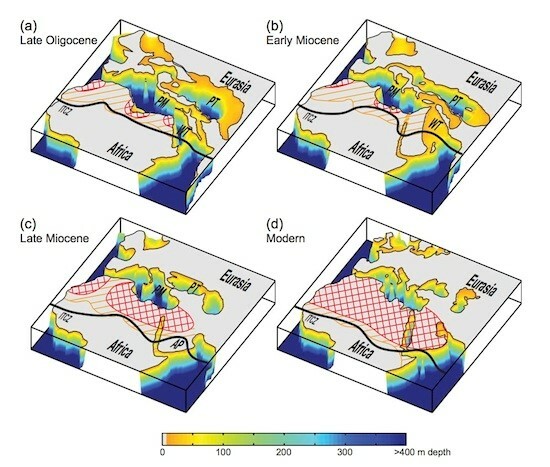 Using snapshot simulations with the Norwegian Earth System Model (NorESM) model suite, the international team explored the climate evolution of North Africa through major tectonic shifts over the last 30 million years. They found that the region undergoes aridification with the shrinkage of the Tethys – a giant ocean that was the origin of the modern Mediterranean, Black and Caspian Seas – during the Tortonian. The simulations are the first to show that the Tethys shrinkage has two main consequences for North African climate. First, it weakens the African summer monsoon circulations and dries out North Africa. Second, it enhances the sensitivity of the African summer monsoon and its associated rainfall to orbital forcing. The Tortonian stage thus marks the time when North Africa shifted from a permanently lush, vegetated landscape to a landscape experiencing arid/humid cycles on orbital time scales. Interestingly, these major changes in North African climate and environment are coincident with an important time period for the emergence of early hominids. The Nansen-Zhu International Research Centre, founded by Chinese Academician Huijun Wang and Norwegian Scientist Ola Johannessen, is an internationally acknowledged climate research and training centre, with emphasis on tropical and high-latitude regions, and the interactions between these regions, for past, present and future climate. Paleoclimate is one of the research interests in this centre. Tethys paleogeography and schematic North African paleoclimate over the past 30 million years. Hatched areas show semiarid steppe climate (orange) and arid desert climate (red) from the simulations, which spread over North Africa during the Late Miocene when the Tethys Sea has been replaced by the Arabian Peninsula (AP). The black lines indicate the position of the simulated summer (June-July-August) tropical rain band pushing south through time.